Having brutally occupied the homeland of Native Americans, the invading Europeans forced the indigenous population onto reservations - land that was specifically selected because of its apparent worthlessness. To add salt to wounds that are still open, multinational energy companies and others are coming back to extract the hidden mineral wealth of the reservations, and are leaving a trail of toxins that, if unchecked, will make the land unlivable for centuries to come. But Native American activists are fighting back, and their inspirational stories are chronicled in "HOMELAND: Four Portraits of Native Action" against the backdrop of some of the country's most spectacular landscapes. � Barry Dana, the former chief of the Penobscot Nation in Maine, is battling state government and the paper companies that have left his people unable to fish or swim in or harvest medicinal plants from the river on which they've depended for 10,000 years. � Gail Small, an attorney from the Northern Cheyenne nation in Montana, is leading the fight to protect the Cheyenne homeland from 75,000 proposed methane gas wells that pollute the water and threaten to make much of the reservation unsuitable for farming or ranching. � Mitchell and Rita Capitan founded an organization of Eastern Navajo people in New Mexico whose only source of drinking water is threatened by proposed uranium mining. � And Evon Peter is the former chief of an isolated Alaska community of Gwich'in people, who are working against current efforts to drill for oil in the Arctic National Wildlife Refuge. With the support of their communities, these leaders are actively rejecting the devastating affronts of multinational energy companies and the current dismantling of 30 years of environmental laws. They are dedicated to forcing change - to save their land, preserve their sovereignty and ensure the cultural survival of their people. Framed by the ecological and spiritual wisdom of Winona LaDuke, HOMELAND presents a vision of how people all over the world can turn around the destructive policies of thoughtless resource plundering and create a new paradigm in which people can live healthier lives with greater understanding of, and respect for, the planet and all of its inhabitants. SHORT VERSION: To create a shorter version more suited to classroom, organizational, and television use, the producers have rearranged the order of the stories as above, and edited them down. Losing none of the power or exceptional visual and audio quality of the original, the short version is also closed captioned. "This is one of the most moving films I've seen in a long time. As captivating and beautifully filmed as any feature film, the message unfolds clearly and fairly, without the usual 'propaganda' tone, and somehow remains hopeful--a positive call to action... the way [the filmmakers] relayed the message as story telling, bringing the audience into the lives of real people--was brilliant, so much more effective than the usual documentary." "Homeland: Four Portraits of Native Action is a tragic and heroic tale documenting centuries of human and environmental rights violations against four Native American communities... 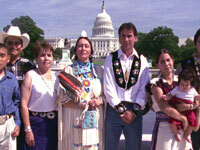 Combining historical footage of Native American community life, the voices of articulate and passionate advocates who describe their spiritual and livelihood connections to their homelands, and politicians and scientists this documentary provides an account of human rights and environmental violations that should enrage all Americans and stimulate more people to consider the environmental cost of unlimited economic growth and to defend their rights to a healthy environment." "An in-depth look at an often overlooked area of environmental issues... These stories are important to all Americans who care about the state of the land, water, and air that we all depend on for survival... Watch, learn, and enjoy!" "Homeland paints powerful and moving portraits of Native action to protect natural resources that all peoples depend upon for life. This film is a 'must see' for students of environmental justice and grassroots activism. It provides insight into conflict between long-term survival and short-term profit making as it simultaneously illustrates courageous and effective advocacy for human rights and environmental protection." "Homeland is an enlightening and well-constructed program... An emotive score laced with native tones complements the often breathtaking footage of the threatened natural landscapes. Historical photographs and footage lend the viewer a sense of the scope and longevity of the struggles of native peoples. Commentary by perhaps the most well-known Native American activist, Winona LaDuke, punctuates and contextualizes the challenges facing the different tribes. The scientific processes that lead to environmental degradation are succinctly explained by geologists and other experts. All of these elements create a clear picture of how the Native Americans' spiritual connection to their homeland and way of life is threatened by unsustainable, harmful practices that affect us all... Highly Recommended." "The treatment of the subject is first class, combining high end production values (it was shot on HD) with the intimacy of a 'point of view' documentary style... Landscapes are captured in evocative cinematography and archive footage is well chosen." "Beautifully crafted... Roberta Grossman skillfully intersperses vastly varied archival clips with quietly impassioned testimonials by tribal leaders and stunning lensing showcasing both the natural wonders and the manmade degradation of the landscape... Homeland merits a wider audience than provided by scattershot PBS airings... At a time when 30 years of environmental protection laws are being rapidly dismantled, Homeland militantly proposes America's First Peoples as the vangaurd of resistence." rds -- and of the brave few who stand up to combat it."